Retreats are held twice a year. Spring and Fall, in the mountains of Western North Carolina. They last from Thursday afternoon through Sunday noon. Meals and lodging are provided. and how it is played. Traditional songs, ballads, hymns and tunes dating back to the 19th century, are shared in an organic, non-competetive manner. The Saturday night concerts feature master traditional musicians. Usually fiddler, banjo player, song and tune collector Bruce Greene or N.C. Heritage Award recipiant Ballad singer and story teller, Bobby McMillon. Gentle Relaxation and Rejuvination Excersises help facilitate a laid back and productive time of music and fellowship. No experience needed for the excersises. All levels of dulcimer players are welcome. Essential knowledge for all levels of dulcimer players. Informal, Fun, Enlightening and in depth lecture / discusion / presentation of the history of the evolution of the construction of the dulcimer, as well as the effects that the changes in construction and other factors and events that have influenced the methods and styles used to music play on it. 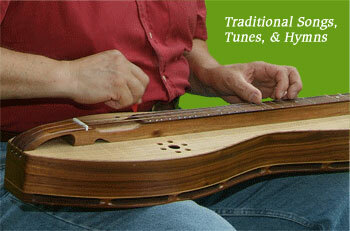 Antique, vintage, replica and modern dulcimers are employed to demonstrate the material presented. First hand information from someone who has been actively involved in playing the dulcimer and studying it's development from the Folk Revival in the 1960's through the present. A unique and rewarding experience. 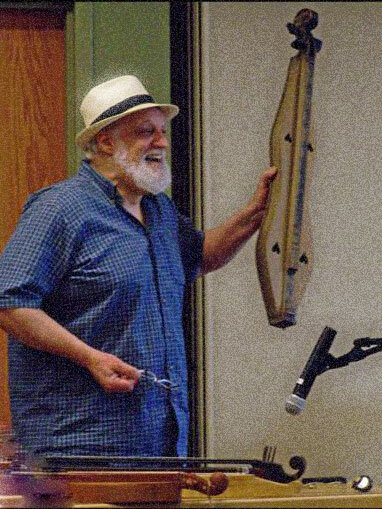 Don has presented his workshop & concert programs for dulcimer clubs and groups from California to Maine. For over forty years Don has played music, learned songs and tunes from many of Appalachia's finest traditional singers and instrumentalists. Don shares his experience in a warm, friendly noncompetitive atmosphere. The Visiting Artist Workshops include a combination of traditional songs, and tunes plus playing techniques. Your group is sure to benefit from Don's often copied, innovative ways of teaching and playing the dulcimer. 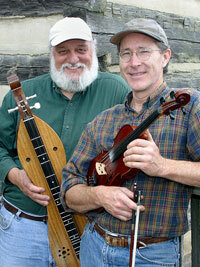 Book the legendary old-time fiddler Bruce Greene and the old-time mountain dulcimer master Don Pedi. Together they create a sound where the whole is greater than the sum of it's parts. Their playing invokes the sound and spirit of traditional Mountain Music with a brilliance that is both timeless and rare. In concert, Bruce Greene and Don Pedi share tunes, songs, and stories, many passed down "by ear" from one generation to the next, dating back to before the Civil War. Old-Time Waltzes and Toe tapping dance tunes, as well as secular, sacred and humorous songs and stories of mountain life are presented in a light hearted and informative manner by two of America's leading folk musicians. Outstanding fiddle / dulcimer duets compliment any gathering; be it a private party, a wedding, a formal dinner, a pig pickin' or whatever. As well as being an excellent entertainment, live music of this caliber provides a distinguished historical dimension to any event . Both Don and Bruce are gentle and gifted teachers. They pass on the tradition in a simple and straight forward manner. Old-Time Music Workshops are offered in a lecture/performance format as well as the hands on classes. Classes range from absolute beginners to more advanced players. The host group provides a place to hold the event. Usually a private home, church or music store. Don offers two different schedules. Custom schedules are also available. Consists of two hour and a half workshops. One Techniques Workshop, one Repertoire Workshop, or a combination Technique and Repertoire workshop and a Way of the Dulcimer Workshop and a concert. If time allowswe can do some jamming. The cost is $20. per person for one workshop or $30. for both. The concert is usually $10. per person. The package price for both workshops and the concert is $35. Consists of one two hour workshop for any or all levels, a concert, and if time allows, some jamming. The cost is $20. per person for the workshop, $10. per person for the concert, or both for $25. Enhance your Dulcimer playing with Western North Carolina's master of the Old-Time style. Below are more detailed workshop descriptions. The Visiting Workshops combine elements of all of these. or all skill levels combined together in one workshop. Also available are Lecture/Demonstration/Performance style Presentations that include multi-media music and slide shows on the History of the Dulcimer and Traditional Music. For the most part, these workshops are designed to explore the depths of traditional Old-Time Music on the mountain dulcimer. Everything from accompanying simple mountain songs, to playing all the notes and rhythms of the dance tunes is available. Emphasis is on playing the traditional style of strumming across all the strings with a pick while noting the melody on one string allowing the other strings to drone. This sound is what attracted many of us to the dulcimer. Learn proven techniques to develop the economy of motion needed to match the rhythms, dynamics and drive of the great fiddlers. These methods work on playing everything from a gentle hymn to an up to speed hoedown. Many of the techniques are also quite effective when applied to playing other, more modern styles of music. How to tune a dulcimer. Simple strumming and noting techniques. One leaves this workshop playing a tune or two as well as with knowledge and techniques to apply to playing many more. Strumming techniques include: applying proper angle, placement and pressure to a strum, how to hold the pick, body mechanics, developing a "fiddle-shuffle" type rhythm for square and contra dance tunes, developing appropriate rhythm for waltzes, jigs and other type tunes, vocal accompaniment, playing with others, vamping and more. Noting techniques include: Three finger rolls, hammer ons, pull offs, slides, vibrato, etc.. The techniques can be applied individually or in combinations. An important method for developing the ability to play Old-Time and other types of music, especially with others, is playing by ear. It is the traditional way the old tunes were passed on from one person to another. The methods employed to learn to play by ear are simple and effective. Many people convinced they could never play by ear have left this workshop with a different point of view. This workshop explores many tunings for the dulcimer. Learn how to choose the best tuning for the piece being played, how to change the key, different modes, etc. Capos will not be used. Popular and archaic fiddle tunes for dulcimer. Rare and beautiful fiddle tunes learned directly by ear from authentic sources or from field recordings. Many dating back to the early nineteenth century from mostly rural individuals who were not professional musicians by trade. Many with little formal education. These tunes were mostly passed down by ear. Many are unique to certain individuals, families or geographic locations. A variety of old-time mountain songs. Learned directly by ear from authentic sources or from field recordings. The songs are mostly arranged in the Old-Time style of playing the melody while singing. Mountain Ballads passed down for generations. A variety of old-time mountain songs and hymns. The songs are mostly arranged in the Old-Time style of playing the melody while singing. Songs include: Where The Sun Never Goes Down, Satan, Your Kingdom Must Come Down, Amazing Grace, When The World's On Fire and more. Traditional Songs to be enjoyed by people of all ages. Includes a mix of Ballads, Secular and Sacred Songs of tragedy, humor and faith. Dulcimer workshops can be designed to fit any group or occasion. Workshops range from those consisting of a short lecture and demonstration to the six hour a day, week long residencies and anything in between. The playing methods and techniques presented in the workshops are basically simple and easily applied. On the other hand, one could spend a lifetime of playing to perfect them. The hands-on workshops listed above can be presented individually or in various combinations. They generally last from between one to two hours depending on the situation.